"No Kauakunihi o Hamakua i Hawaii." Ka Nupepa Kuokoa. Oct. 26, 1872. Click on the Image to See the Full Paper! No Kauakūnihi o Hāmākua i Hawaiʻi. wa ka makemake. Pīpī holo kaʻao. For the Kūnihi Rain of Hāmākua, Hawaiʻi. If it is agreeable to you and your editor, please insert, in a free space of the main portion of your paper, so that the multitudes may see; from the rising of the sun at Haʻehaʻe, to its drooping to the island below, a short story for this rain. And this is its short story. During the time in which a great number of people worked in cultivating the land, from the uplands to the shore, here and there, and in a time of great drought, the plants died from the dryness, and some were pulled up. And at that time, the banana of one person, was what remained in the middle of all the other cultivated fields. While that person was cultivating their land one day, and Kanoa almost arrived at the rays of the sun, and because of his seeing that one of his plants had dried up, he said, "That large dark cloud over there that is dropping rain, come straight over here to my little field, continue on until the yearning is satisfied." When the conversational prayer of this person had completed, that very moment, rain began to fall. The rain came directly from the coast to the field of that person, and it continued until the night turned to day, and until that day turned to night, and his field thrived. And one amazing thing is that not a single drop of rain fell on any other adjacent field. It was only on that person's field that [the rain came] with such enthusiasm until the yearning was satisfied. Sprinkled, the story goes on. These are just a few of the moʻolelo of our ʻāina. 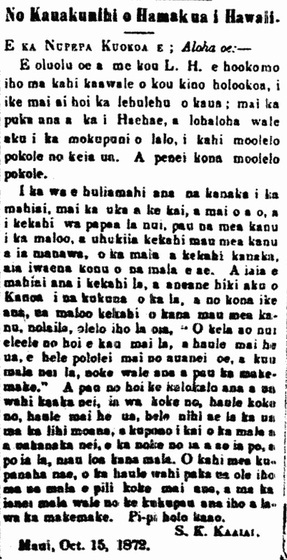 As we continue to uncover more, we will continue to update our moʻo lelo pages. If you know other moʻolelo, ones not posted here, and feel comfortable sharing them with us, please share them on our MAU Moʻolelo Blog Page. Together we can re-member, and piece back together the moʻolelo of these ʻāina! Mahalo nui! Note: All transcriptions and translations done by N. Peralto. If you notice any typographical errors, please let us know on our "Feedback" page. Mahalo!